Waking up and remembering where I actually am. Opening the curtains that are my bed head-rest and there is the Yangtze river swirling by, the mountain side of rocks and dark green trees rising steeply beyond the bank opposite, mists and clouds draping everything mystically. Its a big boat, carrying 400+ people and 92 crew over 6 levels. Each room has two single beds with a sliding door opening onto a balcony between them. A cupboard, desk chair and ensuite with bathtub is pretty much the rest of it. It's all very nice with open areas for relaxing and our group spends a considerable amount of time on the front deck admiring the passing scenery. The Yangtze is the third longest river in the world, originating in Tibet and running all the way to the East China Sea. It's the colour of milky tea and at this point of its journey it flows between steep mountains. We are here in the low water summer period, the much higher winter-level is quite evident on the walls of the gorges and along the river banks. In July 2012 the famous hydroelectric dam was finally completed in the Three Gorges area and upriver all the run-off water ways, the gorges between the mountains and the main Yangtze slowed and filled. Dismantled cities, tombs, historical places, roads and farms slowly became the floor of the river. All within the last decade or so. In one particular side gorge we ferried up where there had been a fast running river one metre deep, there now runs an enormous body of water up to 130m deep. With the mountains shrouded in mist, light rain falling it was beautiful albeit wet! The dam was started in late 1994 and by 2008 1.24million people had been relocated. Old cities demolished, new cities built, ready for the new water level up to 100 m higher than before. Imagine waking up one morning and looking out over what was a valley and realising you now have vast water views, forever. A ferry boat men remembers his mother crying as her family home went under water forever. Another young woman tells me her family was relocated to the new city on the other side of the river in 1997. She is now in an 8th, top floor apartment. In relocation the government gave them the same size building as they were originally in, but her family were able to pay for a size upgrade. Everyday, she climbs 200 steps to go home as, not unusually for a "worker" class apartment, there is no elevator in her building. She also does two tours a day, seven days a week, eight months of the year, each one with 700 steps to climb. But mostly no one speaks of this directly and their English is too poor and I am here too briefly to find out how it made a personal impact on their lives, especially of the older generation. Controversial in many aspects the guides assure us the benefits of the dam are over whelming, natural flooding can be controlled ( certainly an issue in a country where floods have had a devastating impact and huge loss of lives even in the recent past) It provides 2% of China's electricity cleanly and has allowed the Yangtze to become a safe major shipping route. We have seen the river as the busy highway for barges and boats carrying coal, timber, cars, fully laden semi trailers, shipping containers, sand/gravel and of course us, the tourists here to enjoy the beauty of China's grand mountains and river and be awestruck by her ability to change the environment in one generation. A tour around the dam site was awesomely daunting, I remember watching a TV show years ago documenting the construction, it was huge job site, filled with massive earth moving machinery, people, buildings and trucks. 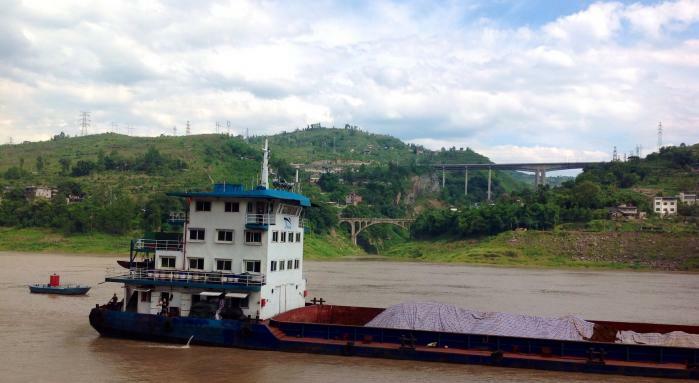 The mighty Yangtze was diverted to one side whilst they built the enormous dam wall and installed the generators. That's all over now, the dam is full, the 28 + 6 underground turbines creating energy, the power lines march out over the land, the look-outs and tourist shops operating smoothly. The boats still move up and down past the dam via a magnificent system of locks, although there is a quicker elevator-lift system for smaller boats which is almost ready to be commissioned. It was a quietly dramatic to be part of the lock system. One evening our cruise boat slipped in behind another boat and the enormous steel gates were shut behind us. Rapidly the water was released into the lock and the boats rose quickly up to the next level. The front door opens and we move into the 2nd lock and the procedure starts again. It takes five locks, and four hours to be raised 175m into the reservoir of the dam. Meanwhile we spent our time either standing in awe on the decks or at the Captains Reception, a rather odd affair where we sat in rows and drank champagne and, if you were brave enough fought the crowds for some canapés. By the time I managed to reach the table I was left with a choice of the decorative orchids and several fish flavoured salty crackers. None the less the dining room is open three times daily and filled with a magnificent selection of hot and cold foods and between eating abundantly, having some serious relaxing time, going on daily tours off the boat and admiring the scenery the days, like the banks of the Yangtze, slip by nicely. The water is is usually a fast moving current and sometimes swirls in to eddies. When we come towards cities there is floating debris drifting rapidly. The gushing water against the boat sounds rhythmic and is the best sleeping music. One night I woke with a start to the cabin flashing white and the sounds of gunfire - but it was just fireworks at 4.30am, lighting up the horizon with reds, blues and greens. "Why?" I said to myself before going back to sleep. We glide along rapidly, the scenery changing from gorges to open mountains, cities with numerous high rises, steep terraced farm lands, huge factories of who-knows-what, shipping yards and an incredible number of impossibly huge bridges carrying tiny matchbox cars which makes our Brisbane Gateway bridge look very ordinary. There are small homes along the river in impossible locations and occasionally men fishing with nets are on the banks, the staff on the boat drop a line in too when we stop. Evenings have been a bit fancy. I've not done a longer-than-one-night cruise before so it's all new to me. We meet in the 'lounge bar' and with a great deal of colour, lights and action the beautiful graceful staff put on a show of some description. We've seen various dances (fan dance, lion dance etc) and at times there is some audience participation. Admittedly when another group of Australians leapt up to sing "Give us a home among the gumtrees" we cringed and the Chinese passengers perked up in astonishment. Another of my compatriots has done a grand job of showcasing our "stubbies and thongs" national dress during the smart casual evening show. Yikes. I've read the fabulous book "River Town" by Peter Hessler twice, ( thanks Doug!) It's the story of an American peace Corp volunteer teaching English in a Chinese university in Yuling, a town on the banks of the joining Yangtze and Wu rivers. Written as the dam was being started it tells of the old town being divided by a painted line into the future under-water and above-water. He writes of the building of relocation apartments for the residents affected and his students, their thoughts and lives. He speaks fondly of his experiences of two years in China, the ups and downs, ins and outs of life as a "foreign devil" when foreign devils were rare on the ground. So with camera Doug I've tried to capture Yuling as we pass it, but really pixels are not bringing it alive like his words did. The carp museum is on the river - gazed at as we chugged by. The Raise the Flag mountain is still there - but maybe not so seemingly high. At midnight we came into Chongquin - back to where we first landed in China. I woke because the night noises had changed, you can hear the noise of the city across the water, traffic, whistles, horns, the sounds of enough people to be the population of Australia. Brisbane river in flood) the diesel engines of the fully laden barges and boats beat strongly as they come past.The water gushes around the moored boat and pylons. No longer is the sky the pitch black of the gorges but the lights of the city reflect on the clouds palely. It's raining as we wake, breakfast and gather our luggage. We are the first group off the boat and the uniformed band springs into action again with a rousing goodbye, and staff are stationed, under umbrellas, fare us well and warn us 'not to trip' but this time we know the faces and warmly thank them for their wonderful hospitality. It's been a wonderful wonderful cruise. Joan What a wonderful description of your cruise, Wendy ! Marian Have so enjoyed reading about your experiences Wendy - you have a gift for writing!! Am very tempted to go now!